Peter Duck meets Great Northern? When I was a small child I was given a copy of The Picts and the Martyrs. I soon discovered the local library had more Ransome books and I eventually read most of them. About the same period I was given another book, Seek There by Eleanor Helme and Nance Paul. It made a similar impact on me but, despite being published simultaneously in Britain and the U.S., it has apparently vanished without trace since last being reprinted in 1949. Ransome-like in theme, it was published in 1933, about the same time as the early Ransome books. It had the advantage, from my child's point of view, of being set in my home county, Aberdeenshire, rather than the far distant Lake District. In 2000 I stocked up on modern reprints of the Ransome canon but all I had left of Seek There was some vivid memories. I eventually tracked down and bought a copy of the 1933 U.S. edition for about $20. Donald and Mary are orphans being brought up by their aunt Elspeth who is apparently in her twenties. 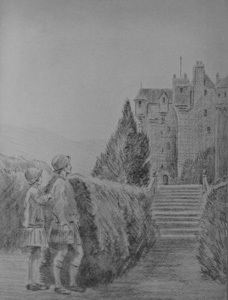 Two years prior to the book's opening the children, Elspeth and their nurse, Maggie, cut expenses by moving from Aberdeen to a cottage on the Ardloy estate west of Braemar. Although the estate is owned by the Finlay family, they haven't the money to maintain it. It is let to Percival Green (Pea Green to the children), an obnoxious Canadian whom it would be financially disastrous to offend. The children embark on a search of the several places mentioned in the verse. They bump into Hugh Armstrong, a Timothy-like young man who, luckily, owns a small sports car. Aunt Elspeth joins the search whenever she can spare the time. This grouping is a variation on the almost total freedom and self-reliance of Ransome's children. Elspeth and Hugh provide resources and responsible adult counsel without being as old or as stifling as parents. Elspeth and the children are excited by the same things although she has adult interests too. She finally achieves the conventional denouement that Ransome never hazarded. Unfortunately, Pea Green acquires a copy of the clues and tries to beat the children to the treasure. Although he turns out to have a shady past, Green is far closer to Mr. Jemmerling than to Black Jake. His use of his chauffeur for the more laborious and dangerous parts of treasure hunting is a foretaste of Jemmerling's bullying of his seaman. One notes a similarity to Swallows and Amazons when the children are on an island digging under the roots of a fallen tree. However, this is a tamer and more conventional book than any of Ransome's. Helme sets her story in the real countryside around Braemar. Her eye for the local fauna and their behavior reminds one of Ransome's but her descriptions are, at times, so vivid that one wonders if one is reading a story or a guidebook. In Peter Duck, Ransome's characters succeed by happenstance. They meet Peter by chance, reach Crab Island first because the Viper loses them in the fog and because they have enough water to sail there non-stop. They find the treasure, not through their digging efforts, but because the right tree happens to fall. They finally elude the cutthroats through the intervention of a waterspout. Helme's children faithfully follow the clues. That these bring them no closer to their goal is not their fault. Even so, their final success, like their finding of the original clues, is accidental. Unlike in Peter Duck, the treasure turns out to have considerable intrinsic worth as well as an historic and symbolic value. The bad guy gets his comeuppance, the good guy gets the girl and the Finlay family recover their ancestral home. The book's end-papers, like Ransome's, display an annotated map of the area of the story. 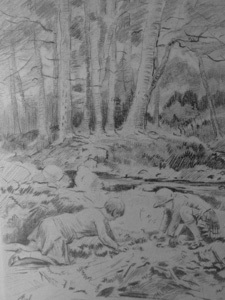 The book contains 15 excellent pencil sketches by Frank Wallace who was evidently a far better artist than Ransome. By the time Eleanor Helme wrote Seek There Ransome had three books in print and was a popular success. This might well have suggested that there was a market for realistic children's adventure stories as opposed to the boarding-school-based pot-boilers being cranked out by other authors. This article is ©2009 by Tom Napier, and posted on All Things Ransome with permission.